News: A small portion of @iamsrk is left to be shot n Bhoothnath Returns will be complete.SRK will shoot in the next few days. "@mtvindia Why doesn’t Kangana Ranaut want to work with Aamir Khan?" - coz she's a queen, and she'll only work with the king and that's SRK. 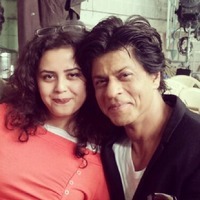 “@dhunki_titas: I really really hope from the very core of my heart that @ifaridoon interviews @iamsrk soon! *Fingers Crossed*” I hope so 2???? 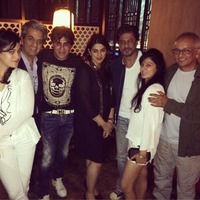 SRK's looking cool . If he's as stylish as this in HNY I'll be happy. Funny, I'll be happy whether he looks 'stylish' or not.
? How's it funny? HNY's a film high on style. @thefarahkhan when all is said & done. U & I will be 'membered for showing a hero like Mandakini. That my lov is our creative legacy..ha ha. Not sure where to put this question: so pardon if this is the wrong place: But does anyone know what the reference to Mandakini is? The actress by that name as far as I can tell was not in MHN. So what does this mean? Mandakini, an actress from the 1980s is famous for her bathing scene under a waterfall in the film Ram Teri Ganga Maili. Ah, now I get it. 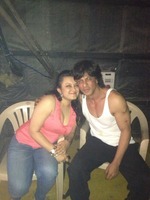 Farah is saying she made SRK into a Mandakini!! Nice!! I kind of love that these seem to be sending joking tweets between them and we are just bystanders let in. Thanks so much for the explanation! @viveckvaswani love u... Goes without saying. Guess who dropped by for a surprise visit!Always a pleasure to meet @iamsrk . Charming awesome and humble as always! I think she is from Sony TV - but I could be wrong.